​In this article, we short-list the top full sized mattresses that are priced under $200. Our aim is to provide you with the essential information needed for you to decide which is the the best mattress within your price range. The mattress market has evolved to become an overwhelming field and it may be challenging at times to know where to start, especially if you are buying a mattress for the first time in many years. The truth is, a flashy price tag does not translate to comfort and great performance. Ergo, it is not about finding the mattress with the most recent in mattress technology but one that suits your sleeping and comfort preferences. However, while you can get the best mattress under $200 having all features that guarantee your comfort in bed, it is imperative to understand that the general durability of this mattress will be low. 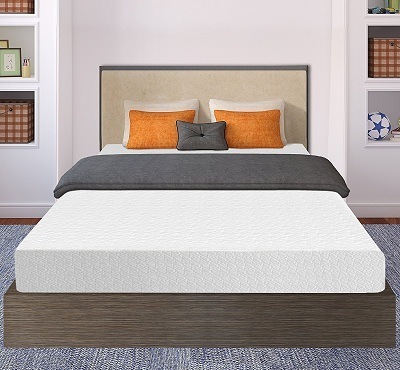 The Best Price Twin XL Memory Foam Mattress was created to offer the amazing comfort associated with memory foam mattress while at the same time offering enough support for a good night's sleep. It is therefore created with a 2-inch soft foam middle layer, which conforms to the shape of your body; this layer contours based on your body heat allowing the shoulders and the hip bones to sink a bit and keeping the spine straight. It also makes you feel as if you are sleeping on clouds and enhances deep sleeping. 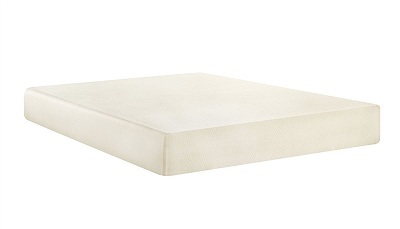 On top of this layer is a 2-inch memory foam which offers a medium feel for people of all firmness preferences. 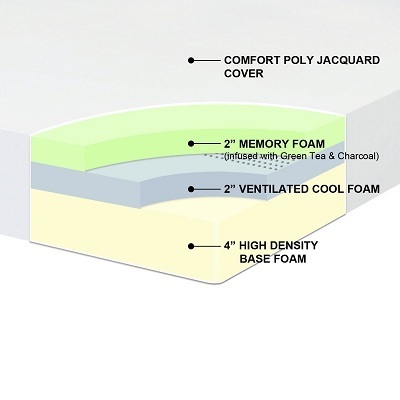 The memory foam is infused with green tea and charcoal to prevent bad odor. Below the soft foam is a 4-inch high-density foam, which ensures the right firmness for great support and durability. This CentriPUR-US certified mattress is offered with a 10-year warranty and a great price for its quality. Designed from ventilated foam, the mattress cools the body at night for more comfort. Its poly jacquard cover can be zipped open and removed making it ideal for children. Polyurethane material gives the mattress fire-proof characteristics. On Amazon.com, reviewers are mostly impressed with the mattress’ great performance/price ratio. According to most of them, this mattress is worth every penny spent on it. Even with its drawbacks, it still manages to garner a great rating as its quality and price surpass its weaknesses. Reviewers, however, noted that the mattress does not last as long as the ten-year warranty guarantee. Like the mattress reviewed above, the Zinus Sleep Master Ultima combines the comfort properties of a memory foam mattress with a medium firm support to offer a sleeper all they need in a mattress. It sports three layers; 2-inch memory foam top which offers a soft feel to the sleeper. Below this layer is a 2-inch pressure relieving comfort foam which responds to the weight of your body and contours to conform to your body shape. This keeps the spine straight and ensures a good night's sleep. The third layer comprise of a 4-inch high density support foam. The memory foam material is made of Bi﻿﻿ofoam, which is made of vegetable materials that is biodegradable. A knitted Jacquard cover adds to the finesse of this mattress. This white cover also adds to the softness of the mattress and with its breathability characteristics, it keeps the user comfortable and cool throughout the night. This mattress offers a medium-firm feel, which is great for most people, but it means that the mattress will lose its firmness faster than those with a relatively firmer feel. Like other memory foam mattresses, the Zinus Sleep Master Ultima will off-gas for a few days and may need airing. This mattress is compatible with most home beds. It is offered with a 10-year limited warranty with no trial period. It is shipped compressed and takes between one and two days to fully decompress. Most reviews on Amazon.com are positive. They are praising the mattress for its performance in relation to its price. According to most reviews, this mattress is ideal for children and for a guestroom, thanks to its medium feel that may turn to a soft feel within a few years. A number of reviewers are happy with the antimicrobial and dust mite resistant qualities of memory foam. The drawbacks of this mattress, as per the reviews, are mainly on durability and off gassing. We found the Olee Sleep 14 inch heavy duty support bed frame that that can be partnered with the mattress. Even with its metal built, the price offering given by the seller is very attractive. 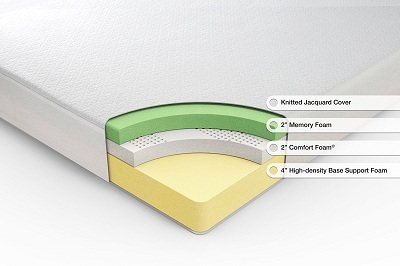 The Signature Sleep Memoir is a two layered memory foam mattress. It consists of a 1.5-inch memory foam top layer that molds to your body shape keeping you comfortable throughout the night, and a 4.5-inch high density support form. 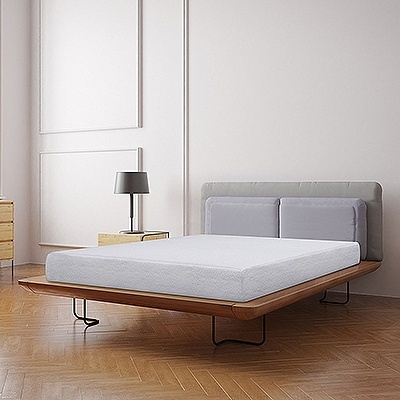 The 4.5-inch support foam gives this mattress a relatively longer productive life compared to other mattresses in its price range. The mattress is offered with a soft breathable knit fabric cover that keeps the body cool by reducing the heat retention quality of memory foam. The mattress fits on different surfaces including on sofa bed, box spring beds, daybeds, bunk beds, trundle and platform beds. This mattress was created to relieve pressure points on your body and enhance a good night's sleep. It is CentriPUR-US certified and therefore comes environmentally friendly with guaranteed performance. It comes fully compressed and takes about two days to attain its full size. Given its memory foam layer, you may have to air the mattress for a few days as it decompresses to get rid of the chemical smell. 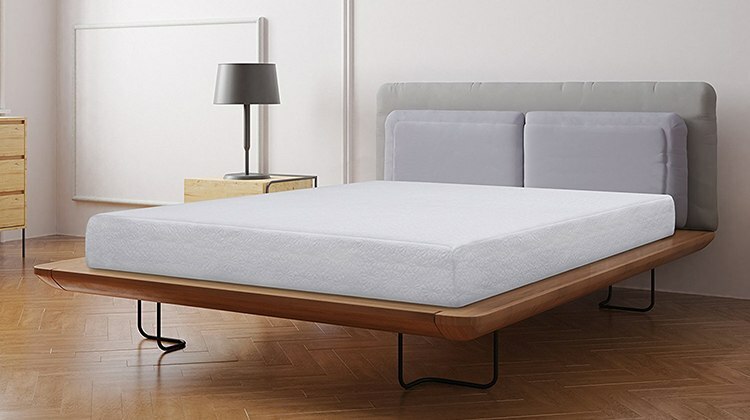 According to most reviews on Amazon.com, the mattress is too firm the first few weeks of use but finally gets soft and conforms to the sleeper's body shape. Again, it does not last long which makes it ideal for light duty use. Majority of the Amazon reviews are positive with most portraying the great performance of the mattress, and also its price. The Zinus Memory Foam Green Tea Mattress shares qualities with the mattresses reviewed above. The mattress seeks to combine the pressure relieving and soft feel of memory foam with the firm support of lower layer to offer a night of great sleep. The top is a 2-inch memory foam layer which offers a soft feel. Below this layer is a 2-inch pressure relieving foam, which sinks as your body weight dictates letting your spine stay straight and comfortable. 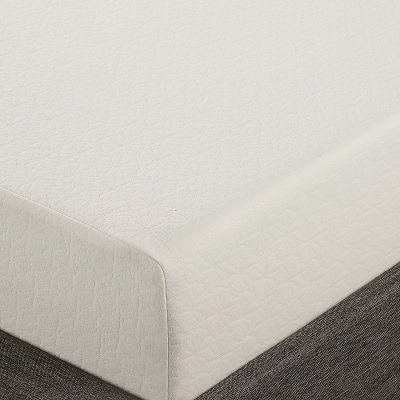 The bottom layer is a 4-inch airflow high-density base foam, which gives support to your body as you sleep. The mattress is CenriPUR-US certified for performance, durability and content. Like other Zinus mattresses, this full size mattress is infused with green tea extracts, a safe antioxidant, that reduces off gassing associated with memory foam mattress; it ensures lifetime freshness. It ships compressed, rolled and packed into a single box and takes up to 48 hours to attain its full size after unboxing. The light weight of this mattress makes it easy to install in different home beds; it fits perfectly on sofa beds, box spring beds, daybeds, bunk beds, trundle and platform beds. Most reviewers are complaining of the firmness of the mattress which seems to be too much the first few weeks of use. However, a high number of reviews have stated how the mattress lightly softens after a few days of use and retains its medium firm feel for a long period ensuring durability. The thing that stands out on this mattress under $200 reviews is that the mattress is a good value for money. You probably know whether you prefer a soft, firm or medium feel mattress. Ergo, it may not be a challenge for you to choose the right mattress for you from a brick and mortar store. However, when it comes to online mattress shopping, there are mostly no trials. Mattresses are offered with indentation load deflection (ILD). Put simply, this is the amount of pressure it takes a 50-square-inch circular indenter to compress the material of a mattress by 25 percent its thickness. The pressure is measured in pounds. ILDs range from a between 12 and 50 pounds with 50-pound ILD being the firmest. This gives you an idea of what you may be looking for. If you are unsure of what to buy, you may be among the majority that falls for a medium feel mattress. It would thus be good to stick to a mattress with an ILD between 25 and 31 pounds. It is advisable that you consider the firmness of the mattress layer by layer (if the ILD for the various layers are provided). Normally, the top layer sports a low ILD – between 12 and 16 pounds – seeing that it is the comfort layer while other layers may have a relatively Higher ILD. A bed with minimal motion transfer is great when you share it with someone as the movements of one person do not interfere with the sleep of the other. You need to get heat retention right as some memory foam mattresses can be very hot on summers. Heat retention is normally solved by addition of a breathable knit fabric, same as in bamboo pillows. If you are fond of sitting at the edge of your bed, you need to buy a mattress with enough edge support to ensure you do not slip off. Lastly, you need to choose the right mattress type for your needs and preferences. There are basically four types of mattresses each with its share of pros and cons; they include memory foam, specialty foam, latex foam and innerspring mattress. It is relatively more durable and retains its firmness for many years giving unbridled comfort. 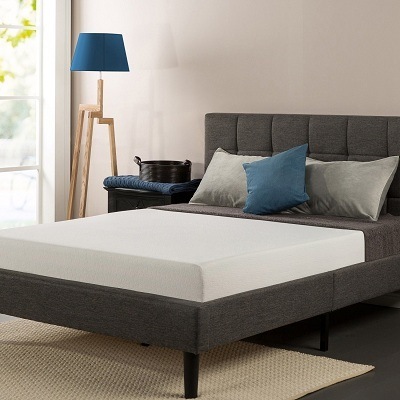 The removable cover offered with this mattress comes handy in reducing the heat retention quality of memory foam thereby keeping the user cool even in summer. It has a relatively low chemical smell which wears off a few days after unboxing and according to reviews on Amazon, the mattress performs.